We know that massive storm waves wreak havoc on coastal cities and coastlines, but scientists thought that massive 620 ton boulders could only be moved by huge tsunamis from earthquakes. Not so. Atlantic storms in winter 2013-2014 moved this gigantic rock, and many other huge rocks weighing well over 100 tons. Wave theory needs to be redone, since the energy in storm waves is much greater than expected. This is horrible news for coastal cities around the globe. How does a scientist find out how much energy is in a storm that hits a coastline? 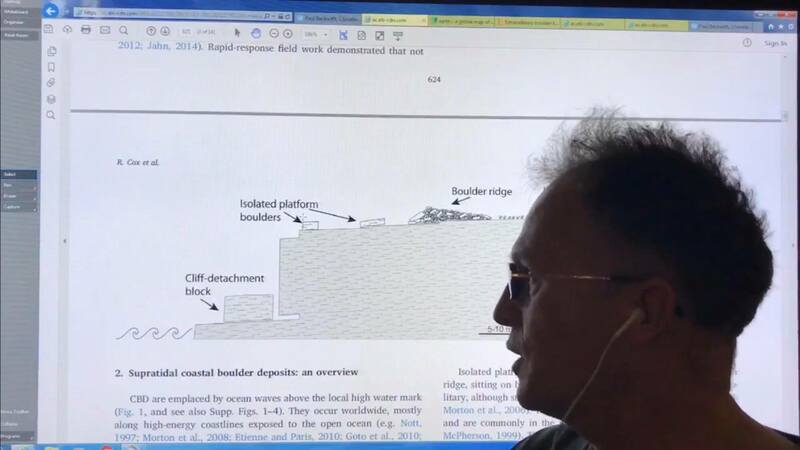 This info is needed to figure out if coastal cities can survive the onslaught of waves atop sea level rise atop storm surge atop king-tides atop land subsidence. In Ireland and Sicily, GPS located photos, and on-the-ground rock measurements were used. In France a camera hung from a kite got detailed rock locations; subtracting images showed changes over time. Bottom Line: Waves pack a much greater punch than we thought. Coastline erosion is much worse than expected. I am quoted in the following: Predicted spike in Ottawa temperatures worries experts, councillor: Susan Burgess · CBC News, March 9, 2018. ‘Numbers no surprise to experts, advocates: The temperature prediction for Ottawa in the 2020s didn’t come as a surprise to climatologist Paul Beckwith of the University of Ottawa. 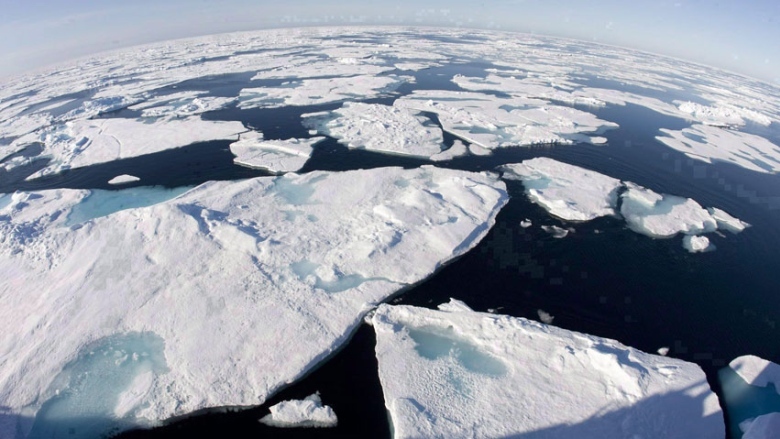 He said, in the High Arctic, warming is happening much faster than anywhere else on the planet and the loss of sea ice contributes to the warming trend to the south. Northern cities will warm much faster than other cities, he predicted. “Ottawa will warm even faster than Toronto, for example,” he said, adding that inland cities will see temperatures rise more quickly than those on the coast or near large bodies of water. Already, Ottawa is seeing the effects of climate change with this unusually warm February, he said, and people living in the city should prepare for future winters filled with the freeze-thaw cycles that wreck the roads and make sidewalks slippery and dangerous for pedestrians. It’s bad news for the natural environment as well. 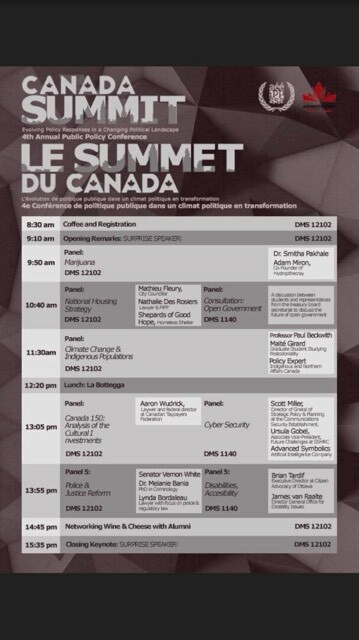 I’m on a Panel Discussion at The Canada summer conference, Le Summet Du Canada. Panel Questions: A lot of the reconciliation work done by ECCC (Environment Canada and Climate Change) and INAC (Indigenous and Northern Affairs Canada) come from direct communication between department employers and indigenous communities. Is there sufficient awareness within departments on challenges facing indigenous people? Are there concrete initiatives in place? Are there any concrete initiatives foreseen to be introduced into the departments to offer sensibility training to employees? How will climate change impact the traditional habits of indigenous peoples; fishing, hunting, etc… and what policies could be put in place by the government (with reconciliation efforts in mind) to ensure the preservation of their way of life? Comment est-ce que la connaissance traditionnelle des autochtones est intégré dans les politiques portant sur le changement climatique et l’arctique en particulier? On February 14th, the Prime Minister recommitted to reconciliation efforts through the recognition and Implementation of Rights Framework. What does that entail for the current and future policies set forward by Environment Canada? How do policies to adapt to climate change come hand in hand with reconciliation with indigenous peoples? There can sometimes be conflict between Indigenous groups and established companies over resource use. For example, new rules giving a large percentage of Newfoundland fisheries to Indigenous groups has sparked outrage among fishermen. Does giving authority over resource use to Indigenous groups help or hurt environmental impact? [1.] Click here, for downloadable report, ‘Errata_-_corect_version_of_Annex_2‘, listing actual cities. Shared with me, by Susan Burgess. Thank you. Click here, for elaborated report, ‘Climate Change and Cities PROOF‘. From shared from Google drive. Sorry. Please notify me if trouble loading. We have multiple solutions. This entry was posted in Catastrophe, Climate, Climate Change, Global Warming, New Video, Rapid Climate Change, Science, Uncategorized, Videos, Warnings, Weather and tagged Altitude, Arctic, Arctic Amplification, Arctic Sea Ice, Atmospheric Rivers, Carbon Dioxide, Climate, Climate Casino, Climate Change, Climate Mayhem, CO2, Coastlines, Convection, Erosion, Feedbacks, Ferrel Cell, Fractured, Geography, Geology, Geomorphology, GHG, Global Warming, Greenland, Hadley Cell, Jet Streaks, Jet Streams, Latent Heat, Negative Vorticity, Paul Beckwith, Polar Cell, Polar Vortex, Positive Vorticity, Pressure, Sensible Heat, Siberia, Siberian, Siberian Atmospheric Rivers, SSW, Storms, Stratosphere, Streaks, Sudden Stratospheric Warming, Superstorms, Temperature, Tropopause, Troposphere, Water Vapour, Weather, Weather Extremes, Weather Weirding, Weather Whiplashing, Weather Wilding. Bookmark the permalink.